Amjad Tufail, a short story writer and teacher of psychology, has been attending weekly meetings of the country's oldest surviving literary circle in Lahore, Halqa Arbab-i-Zauq, for more than 20 years. He says this is the place where he learns about new books, gets an opportunity to meet young writers and hear their views, and perhaps the only institution that trains young individuals how to write in its own peculiar way. Zia ul Hassan is a seasoned poet and critic of significance. His first ghazal collection 'Bar-e-Masalsal' appeared a decade ago. Now he has come out with his second collection titled 'Aadhi Bhook Aur Poori Galiyan' comprising all genres of poetic expression i.e. prose and meteric poems as well as ghazal. Philosophers have always been taking interest in literature. Plato had no patience for poets and had declared to keep his utopia's gates closed for them. Yet his writings are not devoid of literary merits and are still read by many as pieces of fine literature. For the last 67 years, Halqa Arbab-i-Zauq has been regularly holding its weekly meetings in Lahore where people recite their short stories, essays and poems followed by lengthy debates and critical evaluation of these writings by the listeners. "I have never attended a meeting of Halqa which did not teach me something new about literature and its appreciation," says Amjad Tufail. Sheraz Raj, a writer and the literary circle's administrative secretary, says Halqa Arbab-i-Zauq keeps attracting young people which are its lifeline. He says every year four to five young writers join Halqa and they definitely learn from its meetings. The continuity of dialogue and debate on the literary pieces and related social and political issues in Halqa's meetings has no parallel in the country. 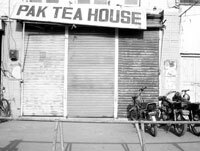 Last April, Halqa lost its abode in famous Pak Tea House which was shut down by its owner for his financial difficulties. For decades, the tea house was a favourite haunt of Lahore's literati in the tradition of French cafes where writers and intellectuals would sit together and would raise storms in the cups of tea. The non-stop commercialisation of the city's downtown put an end to this tradition. With the restaurant's closure, Halqa's future seemed uncertain because its regular visitors were hooked to the place, but it survived. The literary circle now holds its regular meetings in Nasir Bagh's bistro, Chaupal courtesy the Punjab government which was keen to keep the tradition alive. On average, around forty people regularly come to every weekly meeting on Sunday evening. The secretary announces the programme a few days ahead of each meeting. "Halqa is perhaps the only institution in the country that has a written record of 67 years of debate on literary and cultural issues. Its archives are a precious asset of our history," Raj says. Halqa is unique the way it works. It offers opportunity to writers to read their texts in front of cultivated minds and listen to their appreciation and evaluation of the text. This year in one such sitting the participants talked on the recently published novel of Indian writer Shams ur Rehman Farouqi, titled 'Kai Chand They Sar-i-Aasman'. In another meeting, writers and intellectuals discussed the relationship of Urdu literature and music. In its thorough discussions where all participants get an opportunity to express their views frankly, Halqa is different from other such forums such as electronic media's programmes where only select people are invited to talk in relatively formal way. More than 400 people are members of this literary circle including many famous names of Urdu literature, but senior writers occasionally attend the meetings. Sheraz Raj says: "The presence of senior people lifts the level of debates and it becomes a more educative and learning experience for the young writers, but they attend only a few meetings." He says many writers are divided into small groups, which sometimes prevent their coming together. The funding is another major issue that has been a source of worry for running Halqa Arbab-i-Zauq. Its constitution does not allow acceptance of private or government's donations nor does it demand from its members a regular contribution. Thus, the entire responsibility comes on the shoulders of the secretary which is elected every year. The incumbent secretary says the constitution needs to be amended to fix this issue as times have changed and the holding of a weekly meeting requires a few thousands rupees in rent and other petty expenses. He says if Halqa's members are bound to pay some annual fees it will be sufficient to meet its expenditures. Other members think that the entire constitution, framed 60 years ago, of Halqa needs to be revised according to requirements of the time to make it more relevant and to generate more interest in its proceedings. Amjad Tufail, for example, says the format of the discussion was conceived half a century ago in the light of new trends of criticism the world over. He says this format does not allow the writer that presents its piece to participate in the ensuing session of criticism. In his view, he should be allowed to express his views and asked to represent his piece after amending it in the light of the critical evaluation. He also says that in the absence of training institutes for writers in the country, Halqa is the only place where senior writers can impart some sort of training to aspiring young writers, and this needs to be little more structured by holding workshops under the aegis of Halqa. Sheraz Raj says he is working to launch a website of Halqa Arbab-i-Zauq in a few months and hold its annual meeting on the issue of what new shape is required to keep the tradition alive and generate more interest in it. He says Halqa must think over having its own independent building, a library and an archive of its proceedings that are scattered in different places and among different people. The future plans to bring in changes in the way Halqa Arbab-i-Zauq works may or may not materialise because many people may not like to see it changed beyond recognition. The fact, however, remains that under the circumstances it is a precious legacy of our intellectual tradition that has survived unfavourable circumstances. It's a heartening trend to rise above the meaningless dismissal of one form or the other. Instead modern poets are learning to create according to the dictates of their creative self. By doing so, Zia is likely to leave an impact. We can witness his self being sliced into three pieces. One is the man belonging to the land of his origin, a rural feudal locale while the other is the person struggling to announce and preserve his identity in a vibrant urban setting which refuses to submit. The third dimension being the abstract self emerging out of the conflicting counter currents. This emotional and spiritual compartmentalisation has forcefully expressed itself in his different moods and modes of expression. Abdul Karim Nama is a series of poems addressing the suffering and dreams of the farmer Abdul Karim and his daughter Kaneez Fatima. In Wajud his poems are filled to the brim with the cry of an exiled existence in a city where nothing is available to relate with and where he witnesses the painful transformation of his allied souls into materialistic shapes. This situation takes him to the feeling of nothingness and forces upon him a metaphysical rebellion. His poetry is heavily loaded with an air of anger and resistance with the omnipresent quest for change. In his ghazals too, thin throb continues but here, the artist in him makes him cautious since directness in ghazal is likely to destroy its essential decorum. He is quick to transform himself into a ghazalgo here. His poems are in conformity with the genre's demands, though at places he turns a bit prosaic particularly in his poems gathered under the title of Abdul Karim Nama. It's a limitation imposed by the subject matter he deals with in these poems demanding an element of directness. His poetry unfolds a man almost desperately looking for a non-exploitative world around him. He aligns himself with the deprived wretched of the earth remaining a bit loud and bitter throughout the creative work. He is in search of love too but he seems contented and sedate and lashes out at those who cannot settle down with age in their ongoing search for love and feminine beauty. Generally speaking his poetry is predominantly in line with the contemporary sensibility and is an essential part of the mainstream of the works being produced. His ghazals have a vocabulary so close ghazal tradition but he utilizes it in his own way to infuse altered meanings and aesthetics in a strong will to strike individuality. The preface of the book is written by Saadat Saeed while the flaps contain the comments of Javed Shaheen and Abdul Rashid. Inspite of the resonance of contemporary poets particularly in his poems, he seems on a way to strike his own diction and style. We may expect a few wonders in store from Zia-ul-Hassan. Shahid Zaki is a prolific young poet. His first collection 'Khawbon say Khushboo aati hay' appearing in 1999 followed by 'Khawbon say khali Aakhain' in 2001 and his third book appears in 2006 titled as 'Safal mein Aag'. There is always a risk in being hurried in literary pursuits. A tranquil attitude and a careful intent thought is mandatory to ensure a reasonable stature and class in one's works. Though not seen, his previous collections sound romantic while 'Sifal mein Aag' is an impressive ghazal collection replete with mature poetic expression. The book doesn't have a familiar preface or flaps written by dignitaries showing his confidence in himself as a poet. Freshness is an abstract feeling difficult to define. One can only identify its aroma which carries you away from the monotony so prevalent especially in ghazal. Zaki is a refreshing poet with a pleasant flavour. Another important trait in a poet in order to stand out is a tinge of individuality which becomes a token of his identity among countless poets writing around him. It's a very difficult thing to achieve and can only be acquired if a genuinely gifted poet sticks tenaciously to his work alone and refrains from the desire and activities necessary to gain an immediate applause and recognition. Zaki's ghazals do convey a promise of uniqueness and brilliance identifiable with the poet himself. The pundits of literature rightly say that the sharpness of a line (misrah) is a key to the creation of excellent ghazal and is an authentic parameter to judge the command of any poet over this genre. Shahid fulfills this criterion at most places. He is a man with intense subjective pain of living in a hostile unfriendly world of today. His fantasies, pains, dreams and pleasures are rendered worthless by his society but he refuses to submit. His ghazals show us the face of a man who is ready to wait, fight and look for the beautiful peace loving environment around him. His vocabulary is simple but at places it turns complex though it still looks easy primarily due to his artistic command and excellence. He has successfully infused a modern sensibility in the old traditional form of ghazal. Technically speaking he is direct at places while at others he prefers metaphorical expression. By a fresh treatment of select ancient vocabulary, he creates 'Lutf-e-Sukhan' in his ghazals, so enjoyable in this poetic genre. At places one finds his grip loosening and a touch of casualness creeping in while few mistakes can also be spotted but these are most probably self-limiting. As he grows as a poet, he is definitely going to overcome all such short-comings. He has a conversational element in his works which helps his couplets to remain reader friendly and even an average reader of poetry can meet his poetry at least at one level with some concentration of course. But this apparent simplicity harbours within a tricky complexity of content and expression both. Shahid is essentially an enlightened person and frequently questions the validity of the prevalent values in society. At places his non-conformity gets more categorical and well pronounced. 'Sifal mein Aag' contains the promise of emergence of a poet of substance and significance in years to come. Three French philosophers of the recent past -- Jean Paul Sartre, Albert Camus and Simone de Beauvoir -- are now admired more for their best-sellers than their philosophical treatises. Their novels are still talked about in literary circles of the world and their plays are staged but their philosophical writings attract only those who are interested in the history of ideas. Bertrand Russell is not well-known as a fictionist. He owes his fame to technical books like 3 volume Principla Mathematica and Our Knowledge of the External World. But he did pen some excellent stories that have been published in two collections, Satan in the Suburbs and Nightmares of Eminent Persons. On his 80th birthday, Russell expressed the desire to devote rest of his days to writing fiction. In our corner of the globe, Allama Iqbal did not give us novels or stories but we admire him for his poetry. His philosophical writings have been left on the shelf. Atiya Syed is a professor of philosophy who has been teaching at the Lahore College for Women University for many years. But she has also published a novel and two books of short stories. Both the intellectual and literary circles of Lahore claim her as their own. She is, however, not usually seen at literary gatherings. Another professor of philosophy has now come up with a 878-page novel. Mirza Ather Baig heads GC University's department of philosophy and is also known as a dramatist. I admire him for his most difficult-to-understand papers that he presented at the annual sessions of the Pakistan Philosophical Congress. But his novel, 'Ghulam Bagh', has been written in a wonderfully pleasant and lucid style. Published by the Sanjh Publications of Lahore, the novel is an attempt to discover meanings in our completely disordered and absurd post-colonial life. Ghulam Bagh should be welcomed as a valuable addition to our literature that has given a new intellectual dimension to contemporary Urdu fiction. Very few literary novels have been written in Pakistani languages mostly because our writers fight shy of the hard work that is required for writing them. Readers, however, keep looking for such works that is why many foreign novels have been translated into Urdu in the recent years. Baig's novel will probably take time to attract critics but it will not fail to win him many admirers. Three meetings were held in Lahore during the past ten days to condole the death of poet, critic and linguist Sharif Kunjahi who was the oldest litterateur in Punjab. He passed away in the third week of January in Gujrat at the age of 93. As could be expected, the quick and resourceful director of the Punjab Institute of Language and Literature, Dr. Shaista Nuzhat, was the first to organise a reference. It was presided over by Imran Masood, Punjab's minister of education, who hails from Sharif Kunjahi's hometown of Gujrat. The second condolence meeting was arranged by the Lahore chapter of Pakistan Academy of Letters. It was chaired by columnist and playwright Munoo Bhai and speakers included, among others, Shafqat Tanvir Mirza, Afzal Tauseef, Dr. Khurshid Rizvi, Parveen Malik, Zahid Hasan, Mushtaq Kanwal and Iqbal Qaiser. A number of writers, poets and journalists attended the meeting. The third meeting was held under the auspices of the World Punjabi Congress and was chaired by the Congress Chairman Fakhar Zaman. Dr. Azhar Chaudhry came from Gujrat to attend the meeting and recited some verses of Sharif Kunjahi. Hameed Akhtar, Aezaz Ahmad Aazar, Abbas Najmi, Kanwal Mushtaq and Farkhanda Lodhi spoke at the condolence meeting and paid a glowing tribute to the departed soul. The same day, one of the best-known Hindi language fictionist and former editor of the popular Hindi newspaper, Dainik Jagran, Kamleshwar Presad Saxena, died in New Delhi at the age of 75. In our country he was mostly known for his novel 'Kitney Pakistan' which was written in the background of the gory events of 1947. Kamleshwar won many honours in life the last of which was Padma Bhushan, his country's third highest civil award, that he was given in 2006. I chanced upon Kamleshwar at the New Delhi's International Seminar Centre in March last year. We spent half an hour together. The simple and friendly writer was all praise for the city of Lahore that he had recently visited to attend Saarc Writers Conference. He told me that some of the best Indian poets, intellectuals, teachers and intellectuals were born in Lahore. 'Suraj' is now a respectable name in our literary journalism. It is widely read and admired in Urdu circles spread in many countries. Every issue of the journal brings a number of creative, critical and research pieces that speak volumes for the labour and ability of its editor, Taslim Ahmad Tasawar. The 920 page hard-bound current issue of Suraj carries pieces of almost all the major Urdu writers of Pakistan and India. Its special section of Ghalib contains articles by famous Ghalib scholars like Professor Shamim Hanfi, Hakim Zilur Rehman of Aligarh, Dr. Mohammad Ali Siddiqui, Dr. Khaliq Anjum and Dr. Raza Haider. An edition of Dewan-e-Ghalib that was prepared under the guidance of Ghalib himself and was published from Agra in 1863, six years before the demise of the poet, has also been reproduced in the section.